Institutional investors are increasingly looking at Cryptocurrencies as the returns they have generated in 2017 makes this New Asset Class difficult to ignore. 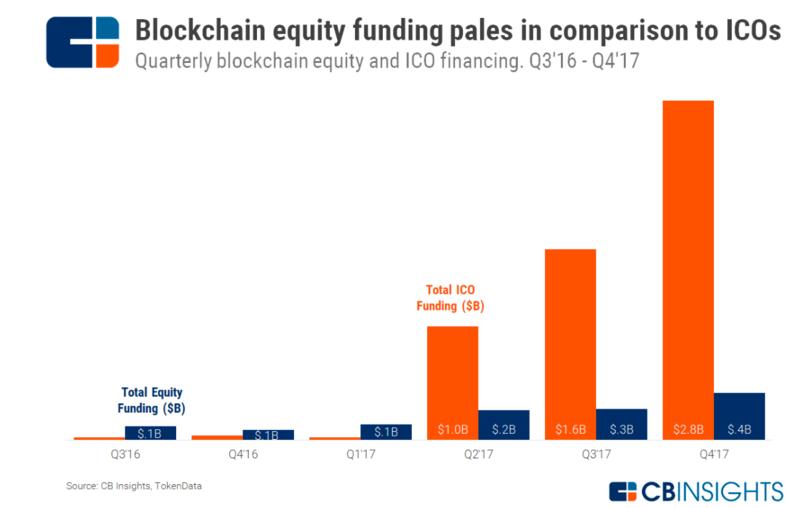 Initial Coin Offerings (ICO) and the Tokens they generate have been compared to the “wild west “but now we are seeing publicly quoted firms issue Tokens and Venture Capital (VC) being crowded out. It is interesting how Crypto Currencies are even being seen as a way to help some institutions to manage risk as the correlation between Bitcoin and a measure of stock market volatility known as VIX seem to be correlated. There are currently over 600 publicly quoted companies in the UK that have a capitalisation of £2million to £50million but they struggle to raise capital and often their daily liquidity ie: the amount of people buying and selling their shares is VERY low. This partly explains why institutional investors like pension funds and banks tend not to buy smaller companies and instead get their exposure to this sector by buying funds or using VC funds. However, in 2017, arguably one of the most powerful technologies, Blockchain, has seen funding from VC dominated by more than 5 times the capital from ICOs compared to VC funding, see below. Many fund managers monitor VIX, as it is believed this gives them a feel for the degree of “fear” or uncertainty of equities and it is a popular measure of the stock market’s expectation of the volatility of America’s 500 largest quoted companies, S&P 500. When investors are sanguine ie not worried, then VIX will typically be low eg: in an environment when the economy is steadily growing, and inflationary pressures are weak. Some equity managers and commentators believe that this low volatility environment is unlikely to continue as we start to see interest rates rise. Uncertainty over corporate earnings will creep in as the cost of borrowing money for business increases and people with mortgages have less to spend, so potentially the price of VIX will rise. Others are concerned that after the massive quantative easing by central banks, ie: money being pumped in to the American, Japanese and European economies, that this will lead to rising inflationary pressures. This could in turn lead to higher interest rates, a slowing in economic growth, greater uncertainty for equities globally, less demand for commodities and lower property price ie: most traditional assets all declining at the same time. 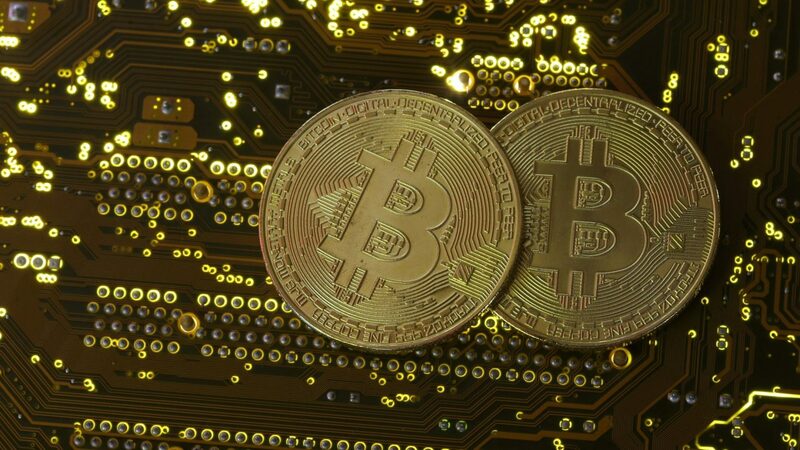 Cryptocurrencies could prove to be an alternative investment in troubled times. Traditional investors are now increasingly looking at Cryptocurrencies as the returns they have generated are very difficult to ignore. While Bitcoin is the best known and biggest Cryptocurrency, in 2017 it was the 14th best performer rising by only 1,318%. 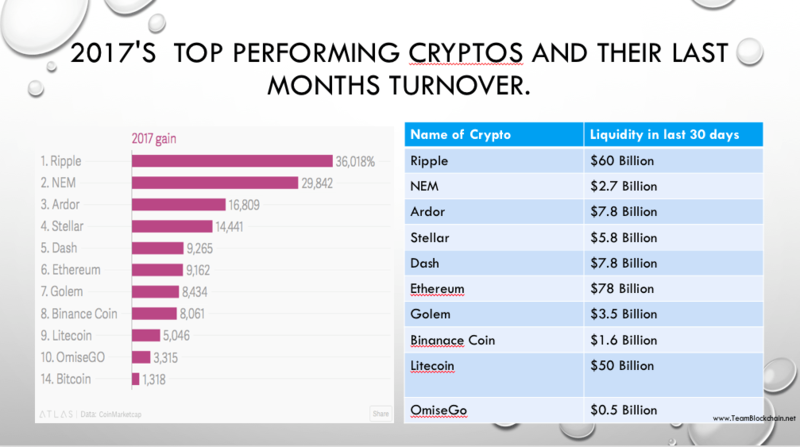 The best performing Cryptocurrency in 2017 was Ripple ,which rose by over 36,000% in JUST A YEAR! Interestingly, Ripple is backed by 100 of the world’s largest banks as they are trying to harness the power of a technology called Blockchain. Ripple has been established to reduce the cost of transferring money between banks and potentially replace SWIFT (Society for World Interbank Financial Telecommunications )which itself had replaced Telex that banks used to use in 1974. What is also interesting in the above chart is the amount of turnover for the top ten currencies over the last 30 days of 2017. The reason this is important is it negates an often cited criticism that there is no liquidity in the Cryptocurrency market, really…… ? While some institutions are not buying Cryptos they are studying their price movements as it may give an indication of what may happen to the future price of VIX. This is rather ironic as the price of Cryptos is largely driven by private investors. In many cases institutional fund managers are not allowed to invest in Cryptos, as their investment mandates do not allow them. Yet institutions that manage the vast majority of money in world equity markets follow the price action of an asset class they themselves cannot invest in! In 2017 the Cryptocurrency market expanded significantly, rising in value to over $700 Billion at one stage . Additionally, we have seen over 1,400 companies issue Tokens to raise capital. This is likely to be just the start of a trend as we see global brands, public companies and even central banks carry out ICOs. In Germany a company called Naga was the FIRST European quoted firm to launch an ICO last December and they raised over 40 Million Euros from 63,000 participants. This is particularly interesting as historically Germans investors tend to be cautious and this ICO was based in Belize! Kodak recently announced they are looking at doing an ICO which has had a significant positive impact on their share price! A Canadian technology quoted firm called Glance is in the process of potentially preparing for an ICO having recently acquired a blockchain based technology App from a firm called Ztudium. Finally Nostrum have announced their intention to do an ICO. Nostrum intend to carry out an ICO in Q1 to expand their following which currently has 800,000 registered people. In effect the ICO is going to be used to expand Nostrum’s attraction and engagement with their clients. They are also looking at doing a secondary listing of their shares in Paris later this year to raise further funds which will be used to increase the number of restaurants and meal making facilities So here is a company using traditional equity markets to expand their infrastructure by selling shares in Paris and launching an ICO to build its brand, to create a digital loyalty programme and further develop its community of customers. These quoted companies are now using ICOs as a source of finance and I suspect we will next see brands and other quoted companies carrying out “AirDrops”, this is when Tokens are given away for free in an ICO. The object of this is to keep their customers attention, to tie in their client’s, and generate more loyalty. We are likely to see ICOs not just being used to raise capital but also being used as part of a firms marketing strategy, to engage and reward their existing and prospective customers. Increasingly organisations are understanding why they need to look after their existing client’s. The environment that we live and do business becomes increasingly more digital companies are adapting and are having to engage with us digitally, whether that be by increasing the amount they spend via online media or offering a digital loyalty incentive scheme. Bain and Company also report that attracting new customers will cost your company 6–7 times more than keeping an existing customer! As the chart below illustrates the importance of existing clients should not be ignored. So why is this important to institutions and how will this impact the Cryptocurrency market? One of the features that deters investors from investing in Cryptocurrencies is their volatility and no track record of the business compared to investing in companies like Apple or Google, where there is considerably more information about the organisation in the public domain. As we see more quoted firms using ICOs to raise capital or giving away Tokens to create their own digital loyalty programs we are likely to see the volatility of these Tokens, and possibly the potential returns be lower. This is coupled with increasing regulation, greater involvement of professional advisors to verify ICO documentation and ensure organisations are compliant which will encourage more investors to buy Cryptocurrencies. However, ICOs for quoted companies are not without risk as directors need to understand and then mitigate any conflicts of interest that may occur between shareholders and Token holders. While raising money from an ICO is very attractive as it does not dilute existing shareholders, nor does it increase the firm’s levels of debt. Buyers of a Token need to be able to understand why the Tokens will increase in value over time and what underpins their value. These questions are starting to be addressed, as are ways to minimise Token volatility. As the Cryptocurrency market matures the losers are likely to be VC firms as companies have an alternative source of finance. Those private and quoted companies that do not embrace the possibilities of this New Asset Class could be over taken by their competitors who use ICOs as a method of funding and or a digital loyalty scheme. A blockchain, crypto economics, ICO and funds specialist, with over 25 years experience as CEO of an asset management business which he floated in London with over £1 Billion under management . His focus has been on the dynamics of financial innovation, advising on ICOs, Tokenomics, Crypto funds,he is a regular speaker and writer on these topics and is co-founder of TeamBlockchain Ltd.